Episode Review: CHUCK, "Chuck vs. the Tooth"
I felt very torn after watching this week's Chuck because on the one hand it brought up some pretty interesting plot developments, but on the other the episode as a whole was kind of boring. To me, "Tooth" was just a filler episode, and a bridge to a more exciting episode next week ("Chuck vs. the Living Dead"). On the positive side, we got a lot of character development this week because Sarah was finally able to say the three magic words to Chuck, and even though they've been official for a few weeks now, it felt like forever. I get why she was initially hesitant, but now they've cleared the last hurdle and can be one happy couple...until they break up. I'm pretty much indifferent about the Chuck/Sarah relationship, and so far it hasn't brought the show down, but I hope we're passed most of the relationship stuff, and we can move on. Another interesting plot point was introduced tonight, and that was how the Intersect is having a toll on Chuck's mental well-being. This new kink started off as Chuck having nightmares, which he believed are glimpses of the future thanks to the Intersect. 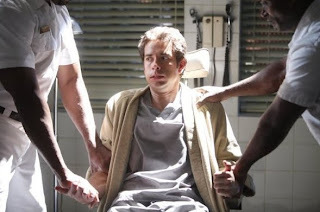 It turns out Chuck was on to something, but his therapist (played by Doc Brown himself) feared that things are not going to turn out well for Charles Carmichael. This may sound morbid, but I'm really excited about this new twist. I'm pretty sure Chuck is going to be fine in the end, but up until now he really hasn't been in that much danger. Sure, he goes on secret spy missions, fights off Ring agents, and tames tigers, but he hasn't had to face a mental breakdown. Most fans probably thought that having a computer in someone's brain that constantly flashes images will really mess with someone's head, and not we're going to see what that is going to look like. I'm also pleasantly surprised how much Morgan has grown on me. He's always been my least favorite main character on the show, but he's been able to mature and develop as time has gone on. I wasn't a big fan of him joining Team Bartowski, but so far so good. Also, kudos to him for turning Anna down, which further proves that he's learning to man up. I never liked those two together to begin with. We also got some heartwarming moments when Sarah went to talk to the doctor just to find out that Casey was also there to show his support for Chuck. The only other character that has grown more than Morgan is Casey, and I'm loving where they're taking his character. He's still a major badass, but I'm glad that we get to see his softer side as well. It'll be interesting how his storyline with Ellie is going to pan out. Speaking of Ellie, I'm starting to cringe every time Sarah Lancaster shows up on my screen, not because of her acting ability, but because Ellie is starting to annoy the crap out of me. Her mother hen schtick has gotten old, and while her being manipulated by the Ring should be an interesting plot point, it's not having a big enough punch because I cannot stand her character. Part of me wishes they had kept Devon out of the spy world until now, so he could be the one the Ring was using because he'd be more convincing as the distrustful one. Ellie had to be brought into the loop eventually; I just don't know if this is the right time or means. So, "Chuck vs. the Tooth" had some strong moments, but for some reason it still fell flat in my opinion. The jokes really didn't land, the action was so-so, and story was serviceable but not outstanding. Again, "Tooth" was OK as a placeholder, and I'm expecting some good stuff from next week's "Living Dead". « Next Episode: "Chuck vs. the Living Dead"